As Americans we uphold, protect, defend and celebrate the values enshrined in our constitution. All our faiths reinforce the creed of "One Nation under God, with liberty and justice for all”. Your presence is a valuable expression of unity. Along with our elected officials, civic, religious and business leaders, you help fulfill our common values and aspirations. Your presence fortifies our commitment to a pluralistic America. Please confirm to confirmattendance@gmail.com. 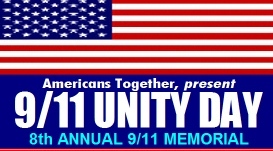 If you wish to list your organization as a participating organization in the event, please share the name of your organization and the web address at UnityDayUSA@gmail.com. It is our duty to honor and cherish individuals who have dedicated their lives to dismantle artificial barriers among Americans. On this day, we appreciate and celebrate their contributions towards building a cohesive America, where no one has to live in apprehension, discomfort or fear of the other. Kindly consider financially supporting this event, and click the following link and do the needful - http://americatogetherfoundation.com/donate/.